In oral arguments before the Supreme Court March 20, justices seemed skeptical about a California law that requires pro-life pregnancy centers in the state to visibly display information about abortions to their clients that the centers say violates their right to free speech. A few of the justices asked about the state’s motivation to put the law in place, wondering if it was more about educating women about state-provided services or if it was meant to specifically target centers offering pregnancy-related services that clients might assume are medical facilities. Justice Elena Kagan said it would be a problem and a First Amendment issue if the law was “gerrymandered” to only apply to certain types of service providers. 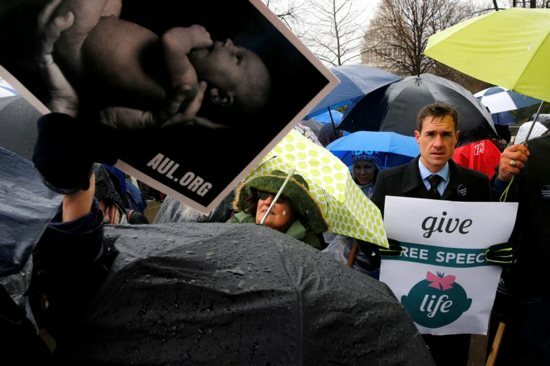 After the hourlong argument, Thomas Glessner, president of the National Institute of Family and Life Advocates, the group representing the pregnancy centers, told the crowd outside that he felt “very optimistic” about the outcome of this case. “Pro-life pregnancy care centers embody everything that is right and good in our nation: generosity, compassion and love that is offered to support both mother and child,” said Cardinal Dolan, chair of the U.S. Conference of Catholic Bishops’ Committee on Pro-Life Activities. The USCCB and several other groups including the California Catholic Conference, the Catholic Health Association of the United States, in friend-of-the-court briefs with the Supreme Court supporting the pro-life pregnancy centers, stressed that the government can’t force people to say things they don’t believe.